_ My motto in teaching and writing about art, including this blog, is 'Art Connects Us.' Art History is a wonderful way to feel the lively embrace of the universal human experience, but if you've ever taken an art history class you probably know that the subject is not ordinarily presented as inclusive. I taught the basic Art History survey course for years so I know well the curriculum of "See what the Greeks did, thought, made - theirs was a distinct culture completely alien to that of 5th c India, 9th c Americas, 16th c Africa, etc., etc., etc." But there is so much art, so many fascinating cultures, time periods, peoples, artists - and it's all part of the human story. _ For me the best approach to art history is to find a common ground in a human idea or concern and then have the fun of exploring the endlessly interesting ways in which culture, climate, geography, available materials, beliefs, and individual imaginations conspire to create distinctive expressions of those basic human ideas and values. _ I teach a university class to students of widely diverse backgrounds using this approach - it's a rich experience for the students and stimulating for me as the teacher. The broad themes sweep everyone into the discussion so there's no reason to feel excluded or sidelined - we're all part of a continuing tradition of art and human expression. Human figures, animals, beliefs, power, wealth, landscapes, family portraits: the list of possibilities never ends. _ The human face, for example, holds a place of importance in nearly every culture and time and gives clues to deeply held ideas and values - but hold onto your seats because the differences in expression are astonishing. Every culture and time period chimes in with intriguing forms and layers of meaning that define and redefine beauty and art. _ The goddess Athena's beautiful stone face is a perfect representation of the serene, logical Classical Greeks, but just as representative of its culture is the lovely Gabon Mask, in which geometry forms a vital part of the design, and the chalkiness of the face indicates a spiritual connection. Vermeer's fresh approach in 'Girl with a Pearl Earring' provides an intimate, seemingly casual portrait, as does Utamaro's glimpse of a much more sophisticated class of women, the Edo Period Geisha. _ Picasso's wild 'Man in a Hat' would seem madness to the Greeks, as well as to Hans Holbein and the court of Henry VIII, to which the pencil drawing of poet Thomas Wyatt gives us insight, but Modern Art finds in it a fresh creative approach to an old subject. Contemporary photographer Cindy Sherman's use of her own face as a canvas speaks perhaps all too clearly of our familiarity with complex questions of shifting identity. _ As we take our seat around the table of humanity, the commonality of 'Face,' as in this small sampling of examples, gives us a place to begin a powerful conversation about the meaning of being human. The discussion may lead in odd directions and take unexpected turns, but how much richer we all are for the inclusion of so many different viewpoints. _ To expand this work and these ideas I'm offering a series of online Art History 'classes' in the form of postcards - Postcard Art History. Each of the series follows a theme in in 10 week subscriptions, with art ranging broadly across cultures, styles, time periods, and artists. Each week you receive a pdf postcard with an image on one side and a brief but solidly informative explanation on the other. Week by week you'll see how cultures and eras interweave and share ideas, values, beliefs. You'll discover differences in the art that work to emphasize commonalities in human experience, and you'll be excited to find new insights and discoveries about art and art history. The themes are fun and intriguing, from 'Supermodels: Glamour Girls of Art History,' 'Gods of All Shapes and Sizes.' 'Happy Families', and others - and I'll be adding new themes regularly. A Postcard Art History series makes a unique, interesting gift for family and friends, a good way to catch the interest of children, and a great treat for YOU! If you enjoy my ArtSmartTalk blog I hope you'll support Postcard Art History and recommend it to others. Find all details at www.postcardarthistory.com. Leave me your email and ask for a sample postcard! _ Chardin was a true local artist, mostly self-taught but smart and observant - and a quiet revolutionary. In contrast to the grandiose Rococo art that is the signature of the period, Chardin took his cue from the deceptively simple Dutch still life tradition. The golden age of Dutch Baroque painting was drawing to an end, but masterful examples of composition, virtuosic effects of light and texture, and the rich possibilities of a simple story told with style and close attention to detail would have been easy for Chardin to find. _ 'Deceptively simple' is a good phrase to keep in mind for Dutch still lifes as well as for the work of Chardin - there is far more than meets the eye. Many Dutch still lifes feature grandiose settings of lavish expensive foods and exquisite vessels of glass, silver, and brass - they do double duty in celebrating the enormous prosperity of Holland during the 17th century, while also paying homage to the simple pleasures of life, free of tyranny by church or king (many contain intricately coded messages, but that's a complicated subject for another post.) 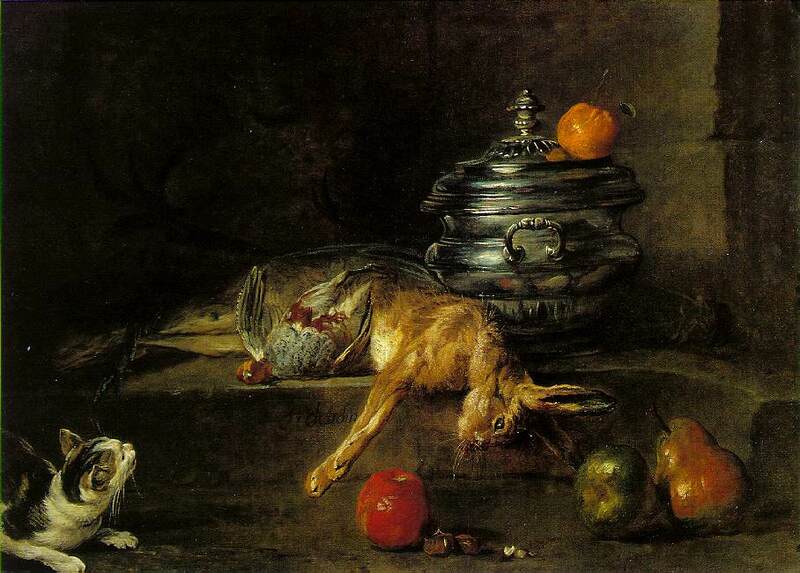 This example by Alexander Adriaenssen, who died shortly before Chardin was born, is somewhat atypical of Dutch still life, but a close match for Chardin. The concentration of raw foods anticipate the feast to come, inviting us behind the scenes to identify with the simpler folk who will do the work of preparation for the 'upstairs' party, while shooing away the cat (look closely) from tempting pile of fresh fish. _ Chardin's revolution was a similar peek behind French aristocratic grandiosity, gently (and probably unconsciously - he was no outright rebel) guiding thoughts to a democratic future that would soon slap France hard across its rouged and powdered face. 'The Ray' from 1728 was one of several early paintings that gained him admission to the Academy. I've always found it to be one of his most interesting stories in paint. There are messages here of life and death, cruelty and comfort. Note the cat (really a kitten) - cute at first glance but with the demonic leer of a killer intent on prey, and in contrast the strange 'face' of the eviscerated ray that evokes a sad commedia del arte clown. The knife - an instrument of death - and the pitcher - a container for water, the stuff of life - hover just at the edge of the table, a precarious position that may be there to remind of us the precariousness of existence. 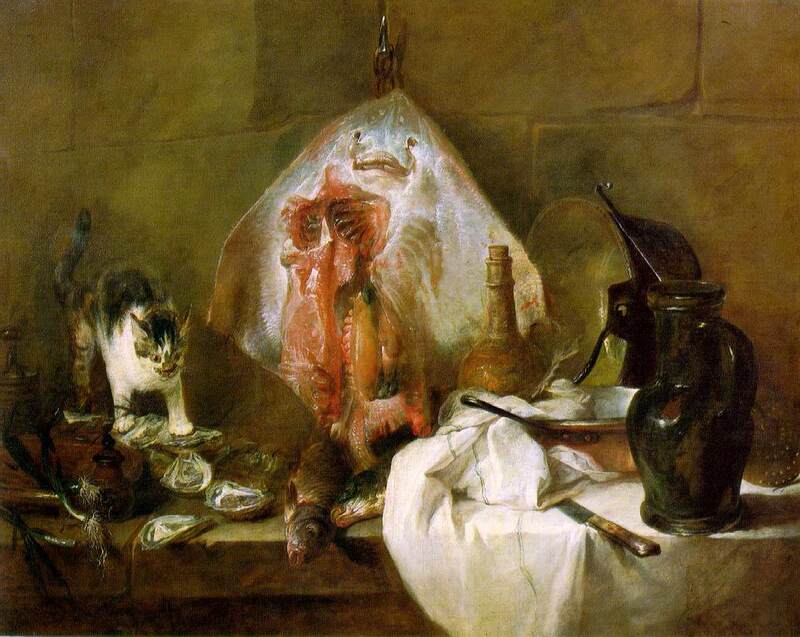 _ 'The Silver Tureen' also by Chardin, also from 1728, also with a cat, seems a meditation on life, with the cat sitting quietly staring into the blank eyes of his fellow creatures , seeming to question the whimsy of fate. _And for dog lovers, 'The Buffet.' There are messages here too, but as far as I can tell the dog is just a dog - always hungry and cheerfully optimistic about that pile of food that just might topple his way. _ He was a handsome guy, no doubt about it. Even with the 27 cents or whatever it was he had in his pocket when he arrived in New York in 1926, he was going to do something and be somebody - you can see it in the pictures. He paid the requisite art dues for about 10 years, working as a sign painter and for the WPA, but by 1935 he was pretty much launched on his career. I doubt, though, if even he knew how important a career that would be. The big retrospective of his work at MOMA - astonishingly, the first major retrospective for him EVER - has been knocking everybody's socks off since it opened on September 18. I certainly concur. It's a fabulous, comprehensive, exhaustive, show, with plenty of 'I never saw that' and 'I didn't know he did that' moments. _ The first of these comes right at the beginning, with the uncannily accomplished still life he painted when he was a teenage apprentice in his native Rotterdam - it's a 'life's not fair' moment, in a category with the portrait Picasso did at a similar age and young Leonardo da Vinci's angel, so beautifully painted that ever after his master Verrochio (allegedly) devoted himself exclusively to sculpture. The de Kooning of the iconic Woman series is present almost immediately by the fierce sense of energy that pervades his work in all mediums, though he worked his way through several influences and experiments with style. I found the first true 'de Kooning' appearing around 1939 with 'Figure,' a small framed study that looks backward to the elegance and form of Renaissance portraits while also sounding a loud call to the colorful, fractured expression of mid-20th century America art. _ Arshile Gorky was clearly important for de Kooning; they were exact contemporaries and shared a studio for a while, probably finding comfort in their common status as uprooted Europeans as well as support for their brave adventures in modern art. I saw a lot of Gorky in de Kooning, even in later paintings, no doubt helped along by the recent Gorky exhibition at the Pennsylvania Museum of Art. Both of them had a way with color that was distinctive, aggressively appealing, even jarring, with a kind of exaggerated sweet palette of pinks, greens, and blues. Cezanne's mastery of color came to mind too; de Kooning had as sure a touch with his particular combinations as Cezanne had with his, though de Kooning's are atonal, minor chords compared to Cezanne's deep resonant harmonies. _ Having said that, I loved his black and white drawings from the 1940's where line and form, splashed and swirled with the same dashing, confident energy, took precedence over color. Gallery after gallery is full of exciting, pulsing shapes and movement; it's like he had a big stew of shapes and ideas constantly on the boil, and he kept stirring it up and pulling out new ways to use the ingredients. The bulbous, throbbing shapes of recognizable limbs and bodies morph into abstract shapes in the drawings, then into more figures, and into his iconic women with their sharp little grinning mouths. _ One wall is hung with 5 of the Women series, a wonderful intellectual and aesthetic gauntlet. So much has been written about these blowsy, powerful females, much of it stuck on descriptions involving 'angry' or ‘frightening.' In my opinion they're rich, somewhat comical, strong, assertive, and assured - they may be aggressive, but why shouldn't they be? De Kooning was looking squarely forward by that time - it's not the old days anymore. At least that's what I like to think, despite knowing that he wasn't always so nice to his flesh and blood wife and fellow painter, Elaine de Kooning. _ Her portrait in the show is a counterpoint to the Women series on several levels. Calm, subdued, done with virtuoso drawing skill and carefully focused on every detail of her face, it could be an 18th century portrait by Jean-Dominique Ingres. The exhibit continues through the last phases of de Kooning's life and career, encompassing a period of pure abstraction and on, into the years when he suffered from Alzheimer's before his death in 1997. Somewhere in the 70's, although the energy and pure panache with paint and surface never flagged, as evidenced by a gallery full of bravura abstractions, the center started to disappear. In the last years it finally slipped away completely, leaving only the untethered ribbons of those sad late paintings. De Kooning is the acknowledged start to 'Abstract Expressionism,' the movement that dominated art during the middle years of the 20th century and changed everything that came after - the MOMA retrospective is the celebration of one of the greatest contributors to the story of Modern Art. _ Is John Marin the greatest watercolor painter that nobody remembers anymore? I hadn't thought of him in a long time, but when I saw the exhibit 'Steiglitz and His Artists' at the Met, it was a chance to consider him again. It's a very interesting show, focused on Alfred Stieglitz's efforts and successes in bringing Modernism to America in the early 20th century. Stieglitz, best known for his own moody atmospheric photography from street scenes of bygone New York to sensual portraits of his wife Georgia O'Keefe, championed European modernists at his Gallery 291, years before America got its big jarring, choking dose of Modernism with the Armory Show in 1913. _ The Met sets up the chronology: first photographs, snow scenes with horse drawn carts and Edward Steichens' beautiful night scene of the Flatiron Building (1904), all recalling a mythic New York that barely resembles hipped-up, maxed-out Manhattan of today. After that (and after annoying his photographer pals for switching his mission) Stieglitz began showing European Modernists, including Matisse, Rodin, Picasso, Lautrec, Cezanne, Kandinsky and others. A room full of intentional shockers - crotch drawings and other 'private' pleasures - gives way to more serious aesthetic engagement with the best and most interesting work at that moment in time. _ Americans are soon in the mix and the balance is pretty even, in the work if not in the big European names. There was important exchange going on, though it was all one-sided then; New World progressives, including Arthur Dove, Marsden Hartley, Marin, and Diego Rivera grabbed at what the Europeans were doing and built their own brave experiments based on fracturing traditions of space, form and color. Francis Picabia "Here This is Stieglitz Here"
_ After 1913, his monopoly on Modernism broken, Stieglitz shifted almost exclusively to American artists, including Georgia O'Keefe, his newly discovered sensation about whom he supposedly said, "Finally, a woman on paper." Some thought Stieglitz had lost his nerve when he closed Gallery 291 in 1917 and stopped seeking out European Modernists. A Frances Picabia drawing of a bellows camera is a disguised portrait with a critical message; the bellows is detached so the camera no longer functions. _ He opened The Intimate Gallery in 1925 with a close-knit group of Americans; the last group of rooms in the exhibit are the testament to their common will to define and proclaim a Modern art of this soil and this place. There are O'Keefes in abundance, but it was the Marin watercolors that held my interest. He had a particular way of cracking and reassembling space that gives a definite nod to Cubism, but with his own distinctly individual sense of blend and separation; it's as if he's piecing back together a jigsaw puzzle of his own devising. In the exhibit we see the arc of his work, from views of Paris (he spent six years traveling and learning in Europe) into stronger and more confident compositions of American elements - open spaces, broad seas and rocky coasts, as well as brassy New York City. _ His vocabulary of slashing strokes, dots and dashes, with color that moves from saturated strength to soft diffusion, gives his small-scale work a dimension that can be almost monumental. John Marin was one of Stieglitz's first artists, and their personal and professional alliance lasted 40 years; O'Keefe and Stieglitz were married at his house. There is a lot to see in New York right now. The deKooning show is a definite Do-Not-Miss - but don't miss this one either.